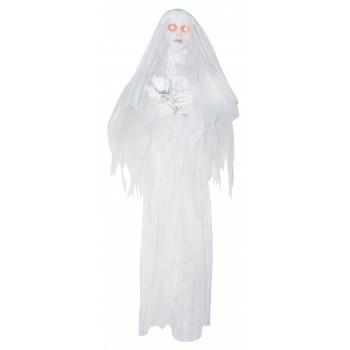 Very disconcerting and spooky, this ghostly bride holds a white rose in her hands as her eyes glow! A great prop! This measures approximately 53.1in x 7.9in x 66.9in Uses 3 AA primary dry Battery batteries included. Sound activated.